This year's Dancing With the Stars unofficial couple has officially been blessed by last season's winners. On Thursday Janel Parrish and Val Chmerkovskiy had a dinner date with Maks Chmerkovskiy and Meryl Davis, who took home the Mirror Ball last year. 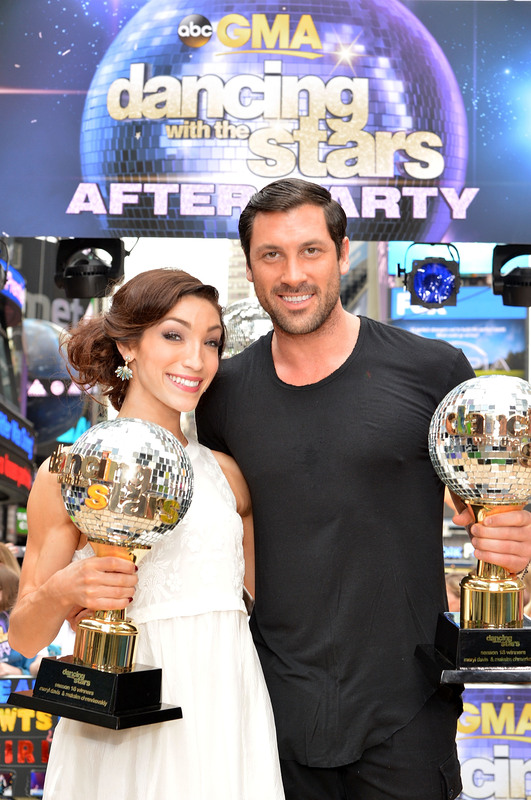 It's well-known that Maks & Meryl's chemistry on the dance floor lead many fans to ship them as a couple, and they have remained pretty close friends even if they're still not actually dating. But the do consider each other family, and now they've welcomed new DWTS almost-couple Janel and Val into the mix. There's plenty of Instagram proof of this seeming double date with Maks even captioning one photo, "Family dinner." Like, awww. Janel Parrish posted the same picture of the group gathered around a table and captioned hers, "So much happy." Val also payed tribute to the night with a snapshot of him with Janel and Meryl and the adorable description, "Dinner time. In company of some pretty amazing peeps. Good times. Better people. #familytime." I guess I don't even care if these people are really dating or not. Or if they invited other random people along for dinner. At this point I just think it's cute that they all hang out together like that. And the fact that they consider each other family? It's too much. So there you have it. Maks & Meryl officially approve of Janel & Val who are the new them. It's too sweet to see the former winners sit down with this year's serious contenders. Maybe at the end of the season they can all go out to a winner's dinner together and post more adorable Instagram pictures of their next almost-double date.